I’m pleased to recognize Barbara with this important honor. Her perseverance, work ethic and leadership qualities are an inspiration to all women. The National Association of Professional Women (NAPW) honors Barbara J. Freeman as a 2015-2016 inductee into its VIP Woman of the Year Circle. She is recognized with this prestigious distinction for leadership in literature. NAPW is the nation’s leading networking organization exclusively for professional women, boasting more than 850,000 members and over 200 operating Local Chapters. As a second-grade Teacher, Barbara Freeman recognized how some children, especially those placed in foster care or from divorced families, needed emotional support. This motivated her to return to school for a Master’s degree in Guidance and Counseling. It also spurred on her long-held desire to write children’s books. 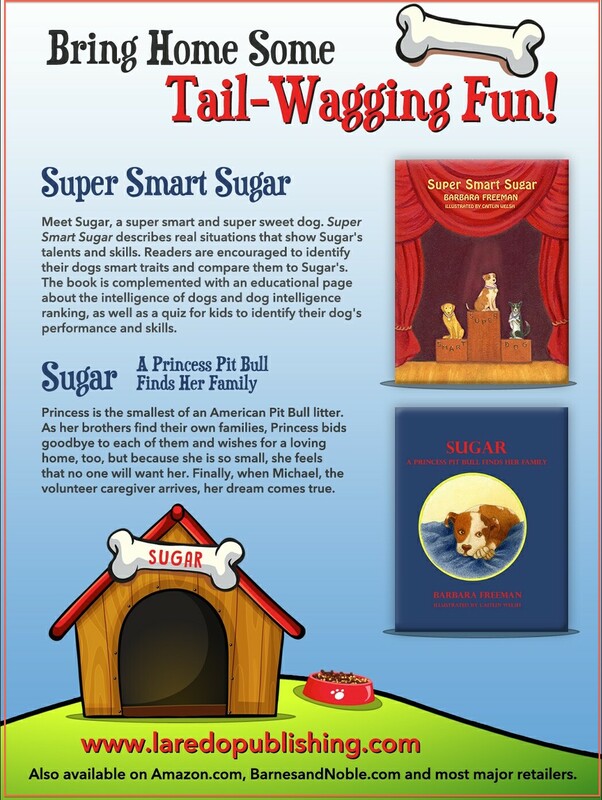 Ms. Freeman’s first book, Sugar: A Princess Pit Bull Finds Her Family, was published in 2013. She followed that with Super Smart Sugar, which was published in February 2015. Both feature her beloved family pet of 13 years, an American Pit Bull Terrier named Sugar. “Sugar taught my family how to give and accept unconditional love; how to engage the entire family in activities, how to remain calm, relaxed and appreciate each other as individuals. She showed us how to find humor and to promote laughter, be patient and to truly value her relentless loyalty,” Ms. Freeman says. Both of her books have won first place in the Purple Dragonfly Book Awards for 2015. Ms. Freeman is currently working on publishing her newest book Mirror Mirror, which like her previous stories, strives to elevate the self-esteem of children and encourages loving relationships with pets. A member of the Nebraska Writer’s Guild, Ms. Freeman will be appearing at the following upcoming events: Barnes and Noble, 2910 Pine Lake Rd., Lincoln, NE, Spring Author Afternoon, April 16, 2 – 3 pm and the Nebraska Humane Society, Book Readings for Children in Camp Kindness, Wednesdays in June and July, 11:30 – noon.